The Bottle Can Crusher can operate on Single Phase Power and yet it can crush PET bottles with the caps on! The standard dual chamber and the ability to add more chambers means that sorting and crushing can take place with ease. 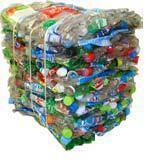 The very dense, yet easy to handle bales of crushed PET and aluminum cans can easily be stacked. The cans do not require any tying and the PET bottles require just two bands. PET Bottles are processed by first perforating the bottles and then crushing them so that this two step process is performed quickly and efficiently. When the machine is set to the 'Can' mode, no perforation step takes place. When set to Plastic mode the spikes system is activated. 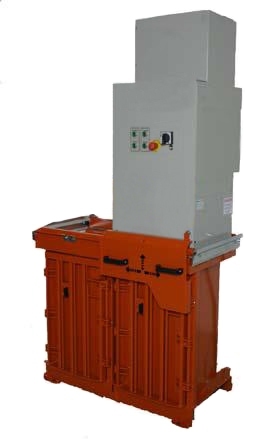 The base machine is a dual chamber and additional chambers can be added. This Bottle Can Crusher is top loading which means it is very easy to use. The Moveable Head (or Compaction Mechanism) slides back and forth effortlessly so that bottle and can deposits can easily be made in their respective chamber. A unique spiking or perforation system for puncturing the PET bottles. Bales are small and easy to handle. Makes Stackable bricks of aluminum cans that break apart easily at processing center. Designed with health and safety standards in mind. 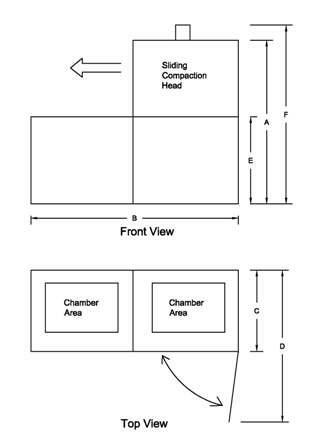 Loading / Charge Opening 16" x 16"
Depth with doors open 41"